This SMLE was manufactured by Royal Small Arms at Enfield. The royal crest and date are visible below. 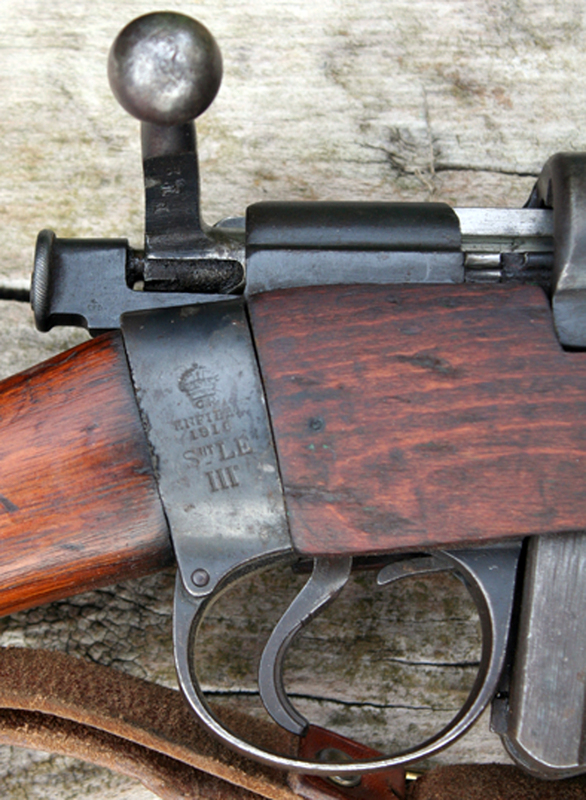 This rifle was standard issue for British soldiers during WW1. I used 303’s when I was in the cadet force at school during the 1960s. 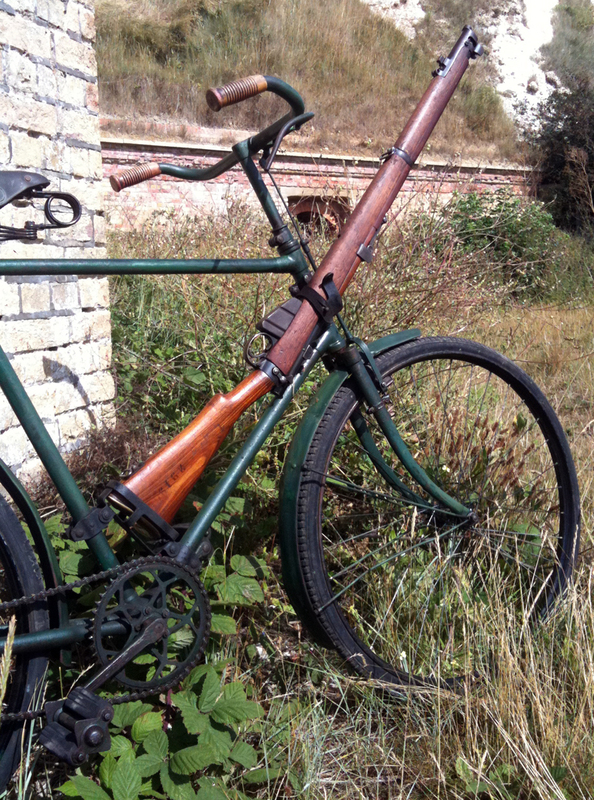 Forty years on, with a young child around the house, this rifle is a deactivated version, and I use it as an accessory for my BSA military bicycles. 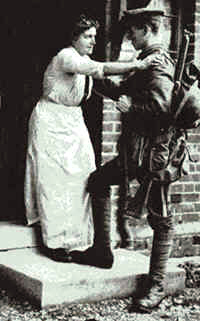 Britain declared war on the 4th Aug 1914. By mid August the Belgians were no more than an irritating hitch to the German advance. Only one intact force stood in the way of the Germans – the BEF. The first shots that the British fired were at Malpaquet, the Germans were pulled up short near Mons as the withering rifle fire of the British caused them heavy casualties. 2 days later on the 25 August 1914 at Le Cateau the storey of Mons was repeated only on a bloodier scale. Once again the Germans attacked in tightly bunched waves and again they were met with rifle fire so intense that they thought the British were equipped with machine guns. At the end of the day 3 British Divisions fell back with the loss 7,812 men and 38 field guns. Some 2000 of which became POW’s. By September 1st 1914 the forward elements of the German Army were a mere 30 miles from Paris. The BEF had earned the title ‘Contemptible Little Army’ from the Kaiser, and the reputation of the SMLE rifle was born. 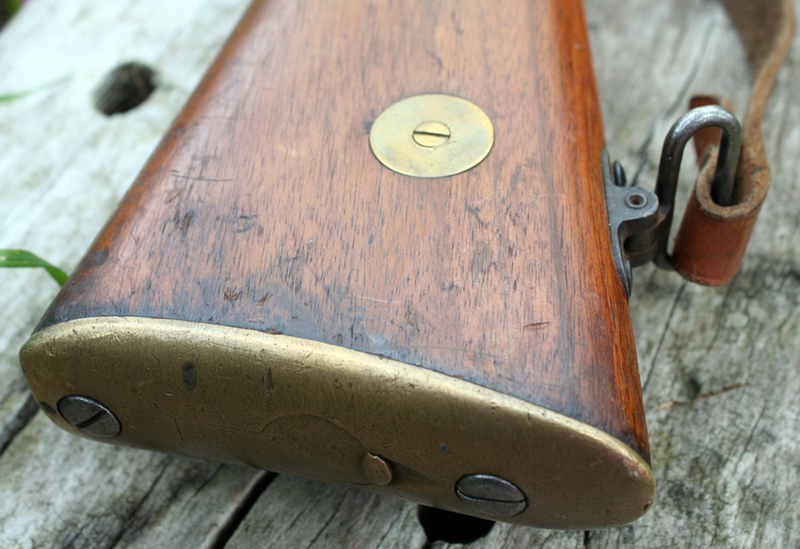 What was conclusively proved in 1914 was the awful power of the SMLE in skilled hands. From the Boer War the Army had worked unceasingly to achieve a standard of speed and accuracy of rifle fire never before considered possible in any Army. The battles of Mons, The Marne and First Ypres showed how successful the training had been. 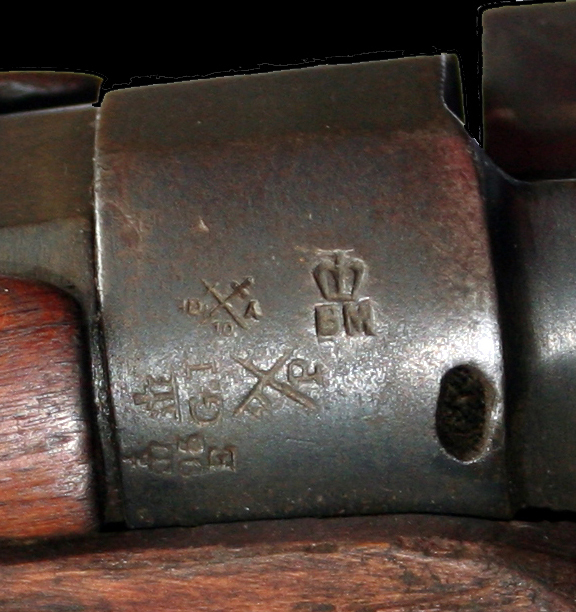 Whilst it has been often accepted that the Short Magazine Lee Enfield is inferior to the Mauser System, particularly as regards the strength of the action and accuracy, it is most likely one of the most “soldier proof” rifles ever designed. It was also preferred for it’s reliability under the most adverse conditions, as well as it’s speed of operation. In 1912, trials conducted at Hythe against the German Service rifle, it was found that about 14 – 15 rounds a minute could be fired from the Mauser, compared with 28 for the SMLE. 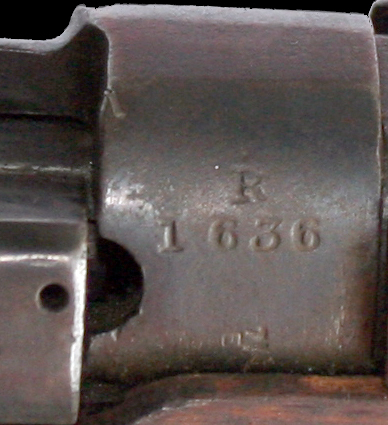 This rifle’s serial number is R1636. 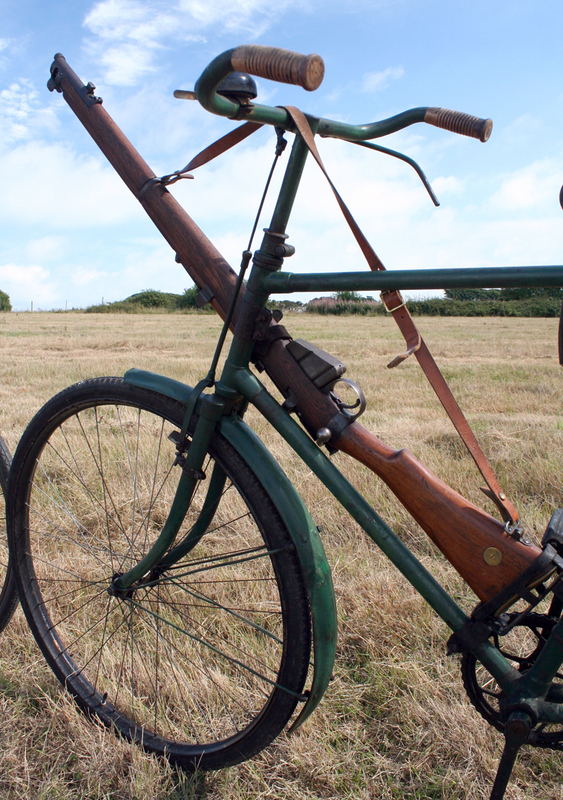 Though they were originally arms manufacturers, there was no direct connection between the company Royal Enfield and the Lee Enfield rifle. What they had in common was the Royal Small Arms factory at Enfield. The directors Albert Eadie (who died in 1931) and Robert Walker Smith started the business in 1891 and displayed ten machines at the 1892 Stanley Show. Smith was a former designer at Rudge responsible for Perry parts and fittings; Eadie was manufacturer of Perry parts and fittings. The company was registered on 24 February 1893 (No. 170,951). An office with showroom was opened at 166 Edmund Street, Birmingham and, from December 1893, at 94 Snow Hill, Birmingham. The badge was a shield with a smaller shield inset containing a field gun facing left. It seems that initially the company sold machines made by the Eadie Manufacturing Co and moved into the former works of George Townsend & Co at Givry Works, Hunt End, Redditch, Worcs from 1896. There was a London showroom at 6c Sloane Street and a Dublin showroom at 73 Grafton Street. During this time the company name changed several times: Enfield Manufacturing Co. Ltd (wound up on 8 January 1897), Enfield Cycle Co. Ltd, New Enfield Cycle Co. Ltd and then reverted to Enfield Cycle Co. Ltd. The Eadie Coaster company merged with BSA in 1907.